The battle lines are drawn once again in the Marvel Comics universe as the opening chapter of the highly anticipated Civil War II event lands with a bang. Following the prologues of the Free Comic Book Day special and issue #0, the extra sized Civil War II #1 is a promising start for Marvel’s latest event that hopes to repeat the success of Mark Millar and Steve McNiven’s original Civil War of ten years ago. Whilst the saga is only just beginning, so far any initial concerns that Civil War II would merely retread what has gone before can be safely put to one side. 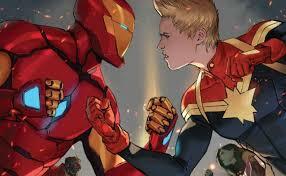 Just as Civil War II features a slightly varied and expanded set of players and their respective affiliations (encompassing groups such as the Avengers, New Avengers, the Ultimates and the Inhumans) it also offers a different set of ethical debates and character viewpoints in comparison to the original Civil War. The central debate in Civil War II concerns new Inhuman Ulysses who is plagued with visions of the future and whether that knowledge should be utilised to prevent catastrophe and safeguard the innocent or that it could in fact alter events in such a way as to create even more danger. As leader of the Ultimates, Carol Danvers’ Captain Marvel firmly believes that future threats should be tackled before they can arise, a case which is supported by the opening battle against a Celestial invasion force which leaves the Marvel heroes victorious. Somewhat surprisingly, it’s Tony Stark who takes the opposing stance, ever the futurist who now finds those values in question when considering the consequences foreknowledge of a possible future could hold. Stark’s side of the argument is upheld when the superhero community is hit by a tragedy none of them could see coming and sets the stage for the rest of Civil War II. With a script packed with drama, emotion and punchy dialogue, Brian Michael Bendis provokes those aforementioned ethical debates without being overly preachy, presenting identifiable viewpoints from both sides, which may make it much harder to choose sides this time around. Visually, this is a stunning book with Bendis enlisting the talents of former Invincible Iron Man penciller David Marquez and colourist Justin Ponsor. Marquez provides lavishly detailed layouts with energetic and epic action scenes – accentuated beautifully by Ponsor’s vivid colours – together with dynamic character work that evokes the right level of ‘feeling’ to those moments of emotion and drama. Marvel’s latest blockbuster comic event is in safe hands. The bottom line: As first issues go, Civil War II shows great potential for Marvel’s latest event with excitement and drama delivered by a trusted creative team. Civil War II #1 is published by Marvel Comics and is available in print and digital formats now. Marvel’s latest event kicks off in ‘Civil War II’ #1 (cover art by Marko Djurdjevic).